The morning sun slowly warms the sandy beaches of Waikiki as your guide escorts you aboard and begins to weave the tales of our island. The Eastern shores of Oʻahu call as you circle iconic Diamond Head and pass through Kahala-where mansions live next door to beach houses. You will find yourself staring down at one of the most photographed places on Oʻahu, Hanauma Bay (closed on Tuesdays). This marine sanctuary is all crystal blue waters and living coral reefs; home to a rainbow collection of sea creatures. Natural wonders abound including molten lava tubes shooting ocean sprays 30 feet in the air as churning waves crash the rocky shoreline. History moves to forefront as you weave up the Koʻolau Mountains to the Nuʻuanu Pali Lookout where King Kamehameha battled victoriously to unite the Hawaiian Islands. And just that quickly you will find yourself in a cleft of the mountain gazing at the Byodo-In Temple commemorating the 100-year anniversary of the first Japanese immigrants. Cruise the seven miles of world famous surfing beaches along the North Shore stopping along the way to enjoy the local flavors. 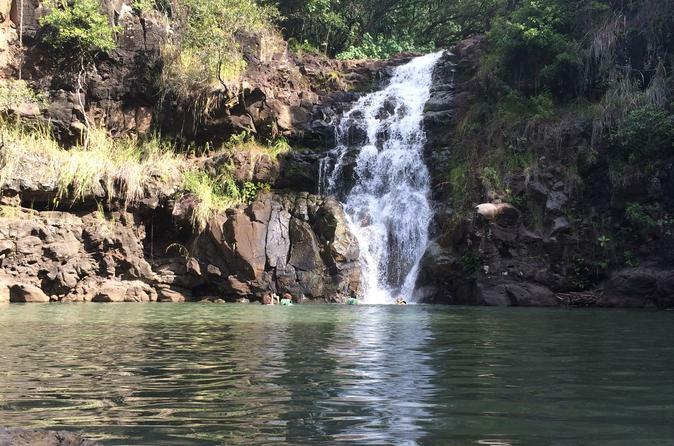 Waimea Falls and the surrounding valley are rich with history, spirituality and island traditions. Your guide will take you through the botanical gardens of this vast and tranquil setting. Learn how deeply embedded tradition is in today’s Hawaiian culture. Around the corner is Historic Dole Plantation surrounded by rows of pineapple and fields of sugarcane stalks. Your guide will share the rich plantation history and describe how this famously sweet and spikey plant became a symbol of hospitality and Hawaiʻi. The scenic round-trip journey from and back to Honolulu is a treat in itself when accompanied by stories and fun facts shared by your guide. Fasten your seatbelt for an amazing circle island excursion that will leave you carefree and full of the Aloha Spirit!